Ligaments are specialized bands of fibrous connective tissue which hold bones in approximation, providing mechanical support and stability across a joint to allow for fluid joint motion and prevent excessive joint displacement. When ligaments are injured, structural, mechanical and physiologic changes occur and joint stability is compromised. A healing response is initiated in an attempt to repair the damage. The degree of healing and repair is dependent on the ligament’s location and the amount of damage that has occurred. Ligaments with greater vascularity (e.g., medial collateral ligament) have the ability to undergo substantial repair, whereas other ligaments (e.g., anterior cruciate ligament) are limited in their ability to restore joint strength and stability. When a full recovery does not occur, the joint is subjected to changes in joint motion resulting in instability leading to biomechanical changes across joint surfaces which increases the risk for degenerative changes and the development of osteoarthritis. It is well-established that high-force or repetitive injury to a joint increases the chances that the joint will develop osteoarthritis over time. There are many options to treat the symptoms of ligament injury and osteoarthritis including rest, ice, heat, non-steroidal anti-inflammatory drugs (NSAIDs), narcotics, physical therapy and exercise, corticosteroid injections, and surgery, but none of these treatments helps restore ligament stability nor prevents or reverses articular cartilage breakdown. There is one treatment available that is able to address ligament function directly, improve stability, and reduce the pain, incidence and dysfunction associated with ligament injuries and osteoarthritis: Proliferation Injection Therapy, also known as Prolotherapy. Prolotherapy is a decades-old, little-used, but well-documented procedure that stimulates the body’s naturally-occurring healing processes to produce more collagen within injured joint ligaments, providing increased stability, decreased pain and improved function. This article reviews the physiology of ligaments and damage sustained due to injury, the body’s response to injury, and the process of ligament repair, as well as degenerative changes and dysfunction that occur when full restoration of ligament function is not achieved. A review of the scientific Prolotherapy literature is summarized, making the case in support of its use for treatment of joint injury and unresolved pain. Ligamentous injuries can occur at almost every joint in the body. Ankle sprains are the most common ligamentous injury, constituting 30% of all injuries seen in sports medicine clinics and the primary musculoskeletal injury seen by primary care.1 Knee pain from ligament injury is also a common complaint, affecting an estimated 20% of the general adult population. The medial collateral ligament (MCL) is the most frequently injured ligament in the knee. In many cases, through a 3-stage inflammatory and healing process, the body is able to repair the injury on its own, with a full clinical recovery of the strength and stability of the joint. However, if the injury is severe or if multiple injuries have taken place at a joint, the damage to the surrounding ligamentous and cartilaginous tissues and other structures of the joint can reach a state that is beyond the body’s ability to fully repair and restore. Damage to the anterior cruciate ligament (ACL) causes the highest incidence of pathologic joint instability.2 This begins the downward spiral of degeneration of the joint surfaces and the development of osteoarthritis and chronic pain. Osteoarthritis is the most common form of arthritis and is typically found in the older population, but there has been a rise in the number of cases reported in the younger adult population, frequently related to joint injuries occurring in athletics, work, or other daily activities. Osteoarthritis can be caused by intrinsic factors (primary OA), which have a genetic and/or biomechanical etiology, as well as extrinsic causes (secondary OA), which are caused by external factors, such as direct trauma, overuse or repetitive motion injuries, corticosteroids, obesity, and/or ligamentous injuries, leading to joint hypermobility and instability. Patients have come to rely on surgical procedures when the pain, disability and imaging studies are determined to be sufficient to warrant such a procedure. Many surgeries performed are based primarily on the findings of imaging studies, most commonly magnetic resonance imaging (MRI), which is unable to identify the most common pain generator(s), including ligaments, joint capsules, muscles and tendons, nor is it able to assess dynamic instability. Surgical options include arthroscopies, ligament reconstruction, fusions and total joint replacements. This often leads to further joint degeneration and additional surgery. Joint replacement surgery is the accepted treatment for advanced joint degeneration/osteoarthritis but it is clear that surgery is employed far too early and far too often. None of these interventions, conservative or surgical, address the damage to the ligaments or the resultant instability of the joint. There is, however, evidence that the Prolotherapy injection method has the ability to stimulate repair of degenerative cartilage (Wheaton M. JOP 2010) and treat the most common and under-recognized source of osteoarthritis: ligament injury. It has been clearly demonstrated for decades that ligaments are a common and certain source of pain and dysfunction. Though the primary focus of this article is the connection between ligament injuries and the development of osteoarthritis, the article also presents Prolotherapy as a valid treatment to repair existing ligament damage and slow or prevent the degenerative progression of the injured joint. Figure 1. Ligaments, when subjected to a constant stress, display Creep (A) behavior – a time-dependent increase in strain. 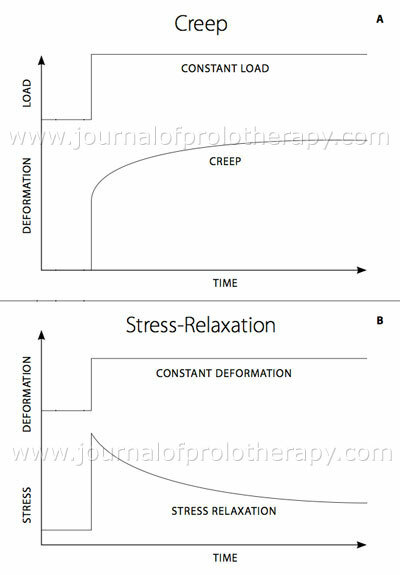 When ligaments are subjected to a long constant strain they exhibit a decrease in the stresses within the material known as stress-relaxation (B). Figure 2. Stress-strain curve for ligaments and tendons. As additional force is applied to the ligaments up until point C, the ligament reverts back to its normal length, once the force is removed. If the force is continued past point C, the ligament is permanently elongated or stressed unless the athlete receives Prolotherapy. Used with permission from: Hauser RA, et al. Prolo Your Sports Injuries Away! Oak Park, IL: Beulah Land Press; 2001. Figure 17-10. When the forces subjected to a ligament are too great, failure occurs, resulting in drastic changes in the structure and physiology of the joint. Ligament injuries, also called sprains, can occur due to direct trauma, indirect trauma or indirect intrasubstance (intrinsic or extrinsic) factors and are evaluated on a scale from Grade I to Grade III. (See Figure 3.) Grade I sprains consist of mild stretching of ligamentous tissue with no discontinuity of the ligament or clinical signs of excess laxity. Grade II sprains have moderate stretching of the ligament with some torn fibers, but enough are intact so that the damaged ligament has not failed. However, joints with Grade II sprains have an abnormal laxity compared to the uninjured side. Grade III sprains consist of severe tearing and nearly complete or complete ligament disruption with significant joint laxity.11 The term “joint laxity” can be defined clinically and biomechanically. Clinically, joint laxity refers to the subjective impression of abnormal movement of one bone relative to the other when a joint is manipulated or displaced by intrinsic muscle forces and is typically compared to the contralateral joint or normal external control. Biomechanically, it relates to the quantitative measure of the six independent degrees of freedom for a given joint and the specific forces or movements that are causing the displacement.12 Disruption of the ligamentous tissue results in instability of the joint, increasing the sliding of joint surfaces, decreasing the efficiency of the muscles, and altering the joint mechanics. Cartilage within a joint is the thickest where contact pressure is the greatest; however, with an injured or loose joint, joint motion is larger. When joint stability is compromised, the kinematics between the bones changes, disrupting the load distribution on the cartilage and bone in magnitude, direction and location of contact, causing wear and increased shear forces, ultimately leading to osteochondral degeneration and increasing the risk for development of osteoarthritis. For example, disruption of ligamentous structures in the knee produces tibiofemoral offset, transferring contact stresses to regions of thinner cartilage with less support, which puts added stress on already weakened ligaments, causing greater ligament injury and increasing the pressure on the cartilage. Figure 3. Grading of ligament injury severity. Grade 3 injuries, however, often need surgery. Used with permission from: Hauser RA, et al. Prolo Your Sports Injuries Away! Oak Park, IL: Beulah Land Press; 2001. Figure 5-16. Figure 4. Three stages of healing after soft tissue injury. Used with permission from: Hauser RA, et al. Prolo Your Sports Injuries Away! Oak Park, IL: Beulah Land Press; 2001. Figure 9-3. Figure 5. After ligament injury, the healing process takes place in three overlapping stages, lasting from six weeks to six or more months. During this time the body utilizes many cells, growth factors and proteins to aid in the removal of damaged tissue, synthesis of new “scar tissue” to fill in the gaps, and remodeling of the ligament structure to a mature state, which closely resembles the uninjured ligament. The etiology of osteoarthritis (OA) has not been fully elucidated. It is clear, however, that the breakdown of joint cartilage occurs when the repair and replacement of cartilage cells does not keep pace with the destruction of cartilage. There are many causes of joint injury, as well as associated risk factors which increase the likelihood of joint degeneration. It may be caused by a systemic (genetic) predisposition or by local (mechanical) factors. For some the cause is known (secondary), but for others the cause is unknown (primary). For example, a person may have an inherited predisposition to develop the disease, but it may only materialize when a biomechanical insult (such as a knee injury) has occurred.22 It should be emphasized that osteoarthritis is primarily a degenerative process, not an inflammatory one as the name implies. A more appropriate term would be osteoarthrosis or degenerative joint disease. Ligament damage or weakness is one cause of joint degeneration. Joint subluxations, dysplasia, and incongruity disrupt the normal distribution of weight and stresses on the articular surfaces of the joint leading to cartilage injury and joint degeneration. The disruption of ligaments and joint capsules, causing increased joint laxity, increases the risk of articular cartilage injury because the joint motion is no longer stabilized by the ligament structure.23 These mechanical abnormalities cause changes in the areas of contact on opposing surfaces and increase the magnitude of impact loading and shear and compression forces on some regions of cartilage. (See Figure 6.) The mechanical properties of articular cartilage depend on the macromolecular framework consisting of collagens and aggregating proteoglycans, as well as the water content within the macromolecular framework. The collagens give the tissue its strength, while the interaction of the proteoglycans with water gives the tissue its stiffness (resistance) to compression, resilience, and durability.24, 25 The cartilage is the thickest in areas where contact pressure is greatest. 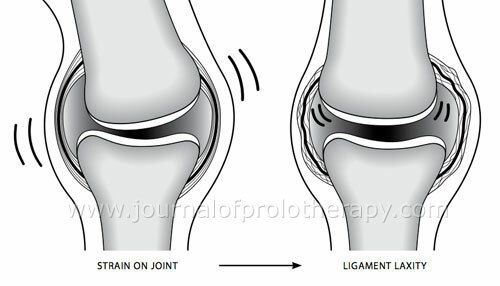 After a ligament injury, joint motion becomes greater and may offset the contact surfaces to regions where the cartilage may be thinner and less able to support the applied stresses.26 The loss of sensory innervation of the joint and surrounding muscles also increases the susceptibility of joint degeneration because of an increase in the instability of the joint.24When the load is applied slowly, the muscles are able to contract and absorb much of the energy and stabilize the joint. However, if the load is sudden, the muscles do not have time to respond to stabilize the joint and decrease the forces applied to the cartilage surfaces. Even normal levels of joint use may cause articular surface injury and degeneration in unstable, subluxed, or malaligned joints and in joints that do not have normal innervation.27 Genetic hypermobility syndromes, such as Ehlers-Danlos Syndrome, as well as non-genetic hypermobility (Benign Hypermobility Syndrome) where trauma or injury is absent, increase the likelihood of OA development. Further prospective studies are needed to study the effects of non-traumatic hypermobility as it relates to OA. Figure 6. Ligament laxity can cause instability of the joint. The result is stretched ligaments and misaligned joints. Direct trauma is a second cause of joint degeneration and is typically associated with athletic participation. The articular surface can be damaged by single or repetitive impact from a direct blow to the joint or bones that form the joint. It can also be damaged by torsional loading resulting from twisting or turning of joint surfaces that are relative to each other. The rate of loading also affects the type of damage that may be caused by sudden impact axial compression or torsional strain. During slow impact loading, the movement of fluid within the cartilage allows it to deform and decrease the forces applied to the matrix macromolecular framework. In sudden or high impact loading, the matrix macromolecular framework suffers a greater level of stress because the loading occurs too fast to allow for adequate fluid movement and tissue deformation.27 One study performed a 36 year follow-up of 141 participants who had sustained a hip or knee injury after 22 years of age and found that, due to the deleterious effects of trauma that had compromised the structural integrity of the joint, 96 (68%) of the participants had developed osteoarthritis in the injured joint.28 Another study showed that 80% of American football players with a history of knee injury showed signs of osteoarthritis 10 to 30 years after retiring.29 Soccer players also have an increased incidence rate of osteoarthritis in the lower extremity joints, mainly the knee, when compared to a control group of the same age. The most common types of injuries are sprains and strains, which are usually caused by excessive forces applied to a joint in an abnormal direction. This leads to a high number of meniscal and ligamentous injuries that ultimately translate to an increased instability within the joint.30, 31 While direct trauma or compression to the cartilage surfaces alone can cause OA over time, it is unquestionably the concomitant ligament injury in the majority of these cases which sets the joint up for OA development. When cartilage wear and degradation outpace cartilage repair, the wheels are set in motion for joint degeneration. Figure 7. Risk factors for development of osteoarthritis. Major Factors Ligament Damage – joint subluxations, dysplasia and incongruity disrupt normal distribution of weight. Trauma – damage to articular surface from single or repetitive impact. Overuse – Excessive joint loading wears down articular surface tissues. Others Above-average body weight, failure to accurately realign fractures, car accidents, poor posture, age, gender, abnormal joint anatomy or alignment, bone deformities, associated joint diseases, genetic factors, occupation, hormones, diet, race, physical activity. There are many options for the treatment of the symptoms of ligament injury and osteoarthritis. Treatment of ligament injuries can take two approaches: conservative management or surgical intervention. Current conservative management options include rest, immobilization, exercises and physical therapy, growth factor injections, cortisone injections, gene transfer technology, collagen scaffold/cell therapy, ultrasound, laser photostimulation, deep heat, pulsed magnetic and electromagnetic fields, electrical stimulation and Prolotherapy. Surgical interventions for ligamentous injuries can include arthroscopic investigation, debridement, ligament tightening, and ligament reconstruction. Surgical interventions for osteoarthritis include arthroscopy, arthrodesis, arthroplasty, and total joint replacement. When OA involves the spine, laminectomy, laminotomy, discectomy, disc replacement and various types of fusion are the surgical choices. Medications are the most common option used to treat the pain and disability commonly experienced with ligament injuries and OA. Medications fall into two categories: over-the-counter (OTC) medications and prescription medications. Analgesics and non-steroidal anti-inflammatory drugs (NSAIDs) are two commonly used OTC medications and both have their pros and cons. Analgesics, like acetaminophen, are used as a short-term treatment for mild to moderate pain associated with ligament injuries and osteoarthritis. However, it can cause acetaminophen-induced toxicity, which includes hepatotoxicity and potential renal damage.73 NSAIDs are also used to reduce pain, but also aid in the reduction of inflammation associated with ligament injuries and OA. Aspirin has been used as an OTC treatment for symptoms related to soft tissue injuries and OA for decades but platelet inhibition and GI bleeding risk have made it unacceptably risky to use on a regular basis. The pharmaceutical industry manufactured NSAIDs many years ago to improve short-term functioning for patients by inhibiting COX enzyme pathways. Drug companies then developed COX-2 NSAIDs which were felt to have the same pain-relieving effects as nonselective NSAIDs, but without the inherent risk of gastroduodenal mucosal damage or cardiac and renal complications.74, 75 The COX-2 NSAIDs celecoxib (Celebrex®) and refocoxib (Vioxx®) entered the market with great acclaim. Both were touted as more convenient with twice-a-day (Celebrex) or once-a-day (Vioxx) dosing to relieve arthritis pain, stiffness and inflammation without as many GI effects. However, a significant number of cases causing indigestion, abdominal pain, and nausea occurred after consumption. With time and a preponderance of evidence, it became clear that the purported GI-protective effects were being reported more frequently than had been originally thought. Because of these risks, the manufacturers of COX-NSAIDs have had to revise their literature to recommend the lowest effective dose for the shortest time period possible.75 So while the NSAIDs are routinely prescribed for joint and muscle pain, the risks can far outweigh the benefits in symptom-relief. Furthermore, using these drugs does nothing to correct the previously proposed underlying problem—injured ligaments and damaged cartilage—and, in fact, they interfere with the first stage of healing, even in tissues with excellent blood supply, slowing soft-tissue repair and thus accelerating joint degeneration. In addition, reducing the perception of pain causes more overuse of a damaged joint. It is ample argument as to why many injuries progress more rapidly to osteoarthritis. Figure 8. The pathogenesis of osteoarthritis accelerated by NSAIDs. NSAID use inhibits the body’s repair processes, leading to decreased proteoglycan and extracellular matrix content and function, which ultimately leads to articular cartilage breakdown. Figure 9. NSAIDs taken long term have a negative effect on joint physiology and ultimately lead to degenerative arthritis. There are other conservative (non-surgical) options for treating ligament injuries and osteoarthritis and its associated symptoms. Among these are the use of braces, physical therapy, chiropractic care, acupuncture, transcutaneous electrical nerve stimulation (TENS), low-level laser therapy, ultrasound, electrical muscle stimulation, thermotherapy, massage, traction, and taping. Physical therapy, as well as other conservative treatment options, can be beneficial in the management of the symptoms from ligament injuries and osteoarthritis. In animal studies performed by Jung et al., the use of moderate, prolonged exercise was shown to be effective in increasing the cross-sectional area, as well as mechanical properties of swine extensor tendons, indicating improved tissue quality.9Ultrasound, laser photostimulation, deep heat, pulsed magnetic and electromagnetic fields, and electrical stimulation are commonly used to treat tendinopathies with the intent to decrease the stiffness of the scar tissue.9 Another study compared the prognosis of two groups of patients with knee osteoarthritis. One group received treatment involving a combination of manual physical therapy and supervised exercise and the other group received ultrasound therapy at a sub-therapeutic intensity. Both groups received treatment twice a week for four weeks. After one year, the patients who had received the four weeks of physical therapy had made significant statistical gains compared to the control group based on the results of knee radiographs and additional testing. They also reported that 20% of the patients in the control group had undergone knee arthroplasty, compared to only 5% of the patients in the treatment group.101 Additionally, a study by Cooper et al. reviewed multiple forms of therapy used to treat symptoms of osteoarthritis. They found that exercise was the most successful treatment method for reducing pain and improving physical function in patients. Patients who received proprioceptive and balance training saw improvements in quadriceps and hamstring muscle strength when compared with a standard rehabilitation program. No conclusions could be made on the effectiveness of the use of proprioceptive and balance exercises in the rehabilitation process after ACL injury.102 Further research is required to determined whether proprioceptive and balance training with improvements in quadriceps and hamstring muscle strength confer any long-term benefits in pain reduction and slowing of cartilage loss in OA. However, it has been shown that weight loss was highly effective in the reduction of pain and the improvement of function associated with osteoarthritic symptoms in obese patients.103 The combination of weight loss and exercise was also successful and provided the best results in a second study comparing the physical function, pain, and mobility in older overweight and obese adults with knee osteoarthritis.104 Reduced weight-bearing exercise such as recumbent biking and pool therapy are better tolerated forms of exercise for patients with advanced osteoarthritis, especially for the obese. While unlikely to reduce OA disease progression, this approach contributes to weight loss, gains in strength, and improvement in cardiovascular function. In those individuals who have undiagnosed and untreated ligamentous injury and joint instability, the effectiveness of physical therapeutics is sub-optimal unless ligament function and joint stability are restored. Injection therapies using various growth factors and cells for treatment of ligament injuries have been the focus of recent research and have become available as treatment options for patients, though many are not covered by insurance. Platelets play a large role in the release of growth factors, including activation of pathways to release platelet-derived growth factor (PDGF), transforming growth factor beta (TGF-β) and epidermal growth factor (EGF).105 Macrophages produce basic fibroblast growth factor (BFGF), transforming growth factor alpha (TGF-α), as well as TGF-β and PDGF, which attract fibroblasts and inflammatory cells to the wound, stimulate fibroblast proliferation, as well as the synthesis of collagen and non-collagenous proteins.106, 107 In vitro studies have shown that the presence of TGF-β increases cell proliferation as well as EGF due to its chemotactic and proliferative effects on fibroblasts, stimulating synthesis of non-collagenous proteins and glycosaminoglycans. BFGF was also observed to attract fibroblasts to the wound site and stimulate replication. 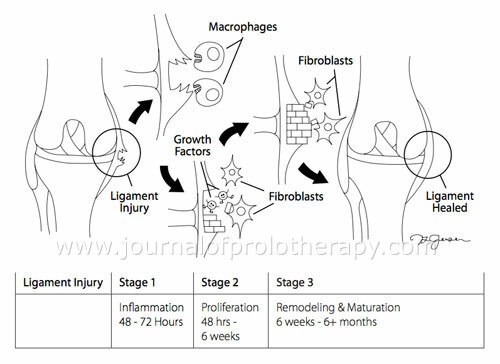 However, the location of the injury, as well as the age of the subject and skeletal maturity affected the ability of growth factors to stimulate fibroblasts. In a more vascular ligament, such as the MCL, the response to growth factors was much greater compared to the response elicited by damage to the less-vascular ACL. Overall it was suggested that the effects of growth factors on cell proliferation and protein synthesis was tissue dependent and therapeutic interventions must account for differences in response to injuries of different ligament tissues. In vivo studies demonstrated accelerated and improved quality of healing with the use of growth factors, however detrimental effects were observed at higher concentrations.8 TGF-β was also shown to increase the size of ligament scars, but did not improve their material strength and did not alter matrix deficiencies. Gene therapy uses transfer techniques to deliver growth factors for longer periods of time at the sites of ligament and tendon healing. It is a fairly new technique that has recently begun to evolve. Prior to gene therapy, collagen and cellulose sponges were used to produce detectable levels of growth factors, but the effects only lasted for a few days. Several obstacles impede practical implementation including adenovirus infectivity and possible immune reactions against the antigen that would decrease expression of the introduced gene.8 Cell therapy is the newest intervention, which incorporates the use of progenitor cells in combination with growth factors to improve wound healing. Mesenchymal stem cells (MSCs) or mesenchymal progenitor cells (MPCs) are implanted into the injured tendon or ligamentous structure and have been observed to significantly improve the structural properties of the connective tissue.8 The use of growth factors causes direct recruitment and activation of local fibroblasts.15 Platelet-rich plasma (PRP) is one example of a growth factor injection therapy and is considered a form of Prolotherapy. PRP consists of the collection of autologous blood, which is subjected to two states of centrifugation to separate the PRP from platelet-poor plasma and red blood cells, and then is injected into ligaments, tendons and other soft tissue such as muscles to stimulate healing of soft tissue, as well as bone.108 PRP has gained a lot of traction in recent years among many physicians who diagnose and treat joint pain due to the healing properties of platelets and their ability to initiate and amplify healing cascades and recruit reparative cells as well as other healing factors associated with soft tissue repair. PRP has been shown to stimulate repair of chronic tendinopathies, including lateral epicondylitis, plantar fasciitis and cartilage degeneration, in a similar manor to standard Prolotherapy treatments.109 It has been described fully in prior issues of The Journal of Prolotherapy. Platelet-rich plasma (PRP) is one example of a growth factor injection therapy and is considered a form of Prolotherapy. Surgery is the end-stage option for the treatment of osteoarthritis pain. It can be in the form of arthroscopy, arthrodesis, arthroplasty, and total joint replacement. When it involves the spine, laminectomy, laminotomy, discectomy, disc replacement, and various types of fusion are the surgical choices. Many of these surgical procedures produce successful outcomes, such as a total hip replacement for an otherwise healthy older individual who has no joint space left and cannot bear weight due to pain. But far too often surgery is recommended prematurely or offered as the only treatment option left. Additionally, there is a lack of definitive studies prospectively showing the treatment (surgery) group significantly improved over the control group. This could, in large part, be due to the difficulty in randomizing the treatment group based on the independent assessment variable of pain level, functional status, and imaging studies, as well as the impossibility of double-blinding the study properly. All of these procedures have risk factors inherent with surgery and are overall very costly compared to other treatment options, including lost income from time off work and lengthy rehabilitation. They also do not address the ligament dysfunction and instability issue. In fact, arthroscopic procedures and surgical repairs increase the weakness and instability in the joint because it involves the cutting of muscles and fascia and removal of discs, cartilage, and ligament tissue.110 Production of scar tissue is also an inevitable consequence of surgery, both in the skin and in the deeper tissues, even with arthroscopic procedures. Because surgery involves the removal of tissue from the affected joint, the patient’s original anatomy is altered. This usually means a change in the joint biomechanics, which may create secondary problems. Surgery also may increase the required rehabilitation time because it often necessitates an extended period of immobilization or limited motion due to pain, wound healing, or to allow for reduction of swelling, all of which increase deconditioning and disability. Rehabilitation can last for weeks, months, or years and returning to one’s previous functional or athletic level may not occur.110 Surgical interventions for ligament injury may invigorate the inflammatory response, increasing the risk of early cartilage degeneration.43 Ligament-injured joints are at increased risk for osteoarthritis. Neither conservative treatments (i.e., physical rehabilitation), nor surgical procedures appear to reduce the prevalence of secondary osteoarthritis. The mechanical instability in a ligament-injured joint likely initiates the degenerative cascade due to changes in the area of contact of the joint surface, disrupting the load distribution on the cartilage and bone. It is even suggested that a “stable” prolonged inflammatory responses can accelerate the progression of OA.8 Joint replacement due to severe end-stage OA has improved the pain and function of many people so that it will, for the foreseeable future, continue to benefit a certain sub-set of patients who receive it. But it has been the premature use of surgery, driven by patients feeling that they have exhausted all other avenues and surgeons who see surgery as the definitive solution in even marginal cases or who lack the understanding of the predisposing factors, especially ligamentous disruption, which, if properly diagnosed and treated before the occurrence of disabling end-stage OA, would lead to successful outcomes and prevention of many unnecessary joint replacements and other surgical procedures. Figure 10. The effects of five Prolotherapy treatments to the medial collateral ligament. Prolotherapy causes a statistically significant increase in ligament mass and strength as well as bone-ligament junction strength. Used with permission from: Hauser RA, et al. Prolo Your Sports Injuries Away! Oak Park, IL: Beulah Land Press; 2001. Figure 6-7. There are three categories of proliferants that have been used; irritants, osmotic shock agents, and chemotactic agents. Irritants (e.g., phenol, tannic acid, quinine) create a local tissue reaction which causes granulocyte infiltration. Osmotic shock agents (e.g., glucose, zinc sulfate) create a local tissue reaction to stimulate granulocyte infiltration by dehydration. Chemotactic agents (e.g., sodium morrhuate) cause direct activation of local inflammatory cells.15 The most commonly used solution contains dextrose mixed with an anesthetic and diluted with sterile water or saline. Many substances can be used as proliferating agents, separate from or added to the standard dextrose solution including zinc sulfate, P2G (phenol, glycerin, and glucose), sodium morrhuate (derived from cod oil), calcium gluconate, pumice and others. Other substances and nutrients can be added to the solution, depending on the Prolotherapy physician’s experience and training, as well as the condition being treated. A unique syndrome reported in the literature which is rarely recognized that warrants mention for its responsiveness to Prolotherapy is called Barré-Lieou Syndrome. It was first described in 1925 by Jean Alexandre Barré, MD, a French neurologist, and in 1928 by Yong-Choen Lieou, a Chinese physician, each studying it independently.124 It consists of a constellation of symptoms stemming from dysfunction of the posterior cervical sympathetic nerves along the cervical spine vertebrae caused by weakened, stretched, or damaged cervical spine ligaments. The symptoms which characterize Barré-Lieou Syndrome include some or all of the following: headache, vertigo, tinnitus, neck pain, sinus congestion, blurred vision, hoarseness, and other symptoms related to abnormal tension on the sympathetic nervous system in the neck. While none of these symptoms confirm a diagnosis of Barré-Lieou Syndrome, the clinical case for it becomes more compelling when many of these symptoms are grouped together. The usual studies do little to diagnose this syndrome. Clinical recognition of Barré-Lieou Syndrome and its definitive resolution by Prolotherapy eliminates the need for costly investigational assessment and unnecessary and inappropriate interventions targeting the various symptoms that are part of Barré-Lieou Syndrome. It proves useful to compare the safety of Prolotherapy to the surgical risks described earlier. One study surveyed 494,845 patients treated for chronic pain with Prolotherapy and found only eighty (0.00016 percent) complications. Sixty-six of the cases were considered minor complications and included allergic reactions and pneumothoraces, while 14 were defined as major complications and required hospitalization.125 Prolotherapy does not require anesthesia or the removal of tissue from the body or addition of foreign objects into the body, only takes a few minutes, does not require rehabilitation, and has a minimal risk of complications.110 Furthermore, there is negligible down-time following treatment, no damage or destruction of nerves or blood vessels, and scar tissue is not produced. The degenerative process associated with weak and unstable joints can be slowed and potentially prevented by treatment with Prolotherapy. If treated in the early stages, the proliferation of new ligament tissue strengthens the joint and helps restore proper joint mechanics and fluid joint motion. By decreasing laxity of the ligaments and instability of the joint, contact forces can be redistributed back onto the areas of thickest cartilage that are designed to handle high loads and reduce the stress at thinner, weaker points, allowing for healing to take place and preventing degeneration. Even in later stages of degeneration and OA, improvements in pain, instability and function are possible as described in the above studies. By adding stability to the joint, along with the proliferative inflammatory process provided by Prolotherapy, the body is able to repair damages incurred to the articular surfaces and restore the joint space width. In addition to a favorable safety profile, Prolotherapy produces positive results in 75 to 90% of patients by resolving chronic pain issues.110 It is the treatment of choice for ligament injuries (sprains, tears, instability, and benign hypermobility syndrome) and the resultant cartilage degeneration that these injuries cause. The loss of articular cartilage and the osteophytes (bone spurs) located at the entheses where ligaments attach to bone at the margins of joints and in the spine can be prevented or reversed after one of the main causes of joint degeneration (i.e., instability) is eliminated by the stabilizing effects produced by Prolotherapy. (See Figure 11.) The process of stimulated ligament repair is joint reconstruction at its core. The vastly different risk-benefit profile of Prolotherapy versus joint replacement surgery or drugs makes Prolotherapy the treatment of choice in all but the most extreme cases of ligament injury and joint degeneration. Figure 11. Beneficial effects of Prolotherapy in the prevention of degenerative arthritis. Gustav Hemwall, MD, built on Dr. Hackett’s definitive work and the discovery of the link between ligaments and joint pain by emphasizing the recognition of ligaments as the key source of chronic pain. He accomplished this through his many years in clinical practice and by teaching other physicians about the use of Prolotherapy. He taught that Prolotherapy is an extremely safe and effective procedure when thorough study of anatomy is combined with the proper physician training. To continue the advancement of the original research and the proper use of Prolotherapy first described by Drs. Hackett and Hemwall, the Hackett-Hemwall Foundation provides training to physicians in the technique of Prolotherapy. A full discussion of Dr. Hackett’s research and the technique of Prolotherapy is found in the book he co-authored with Dr. Hemwall, Ligament and Tendon Relaxation Treated by Prolotherapy. A review of past and current literature has provided ample evidence to definitively support the connection between ligament injury and joint instability and the development of degenerative osteoarthritis of peripheral joints and the spine. At best, standard treatment protocols temporarily modify patients’ symptoms and, at worst, they may result in unexpected side effects (e.g., drugs) or morbidity with more aggressive intervention (e.g., surgery). The Prolotherapy approach is the most reasonable and effective treatment method for joint-related problems because it addresses the most common cause of joint pain and disability, relies on the body’s natural repair and healing processes, results in long-term improvement, can treat virtually every accessible joint in the body, obviates the need for higher risk and/or destructive interventions, has an extremely favorable safety profile, is compatible with an active lifestyle with little down-time involved, and ultimately saves both direct and indirect health care costs. The relative short-comings of Prolotherapy are: the need for adequate time and treatment to receive full benefit, the use of needles which carries some degree of discomfort and apprehension, the lack of well-trained Prolotherapists throughout the country, general non-acceptance of the method from the health care industry, and costs that are usually borne by the patient. Prolotherapy is not a panacea, in that it cannot completely resolve every joint problem, but when used in a timely fashion and performed by a skilled practitioner of the technique, it overcomes nearly all the objections to its regular use. As more research into joint disability and healing is gathered and well-designed clinical studies are performed confirming current understanding, Prolotherapy will likely become a part of the medical school curriculum and be more available to vast numbers of people across the nation who suffer from the disabling effects of chronic pain. Mahaffey D, et al. Ankle and foot injuries in sports. Clinical Family Practice. 1999;1(1):233-250. Levy D, et al. (2011). Soft Tissue Knee Injury. Retrieved from: http://emedicine.medscape.com/article/826792-overview#a0199. Roy S, et al. Effects of Opioids on the immune system. Neurochemical Research. 1996;21(11):11375-1386. Vallejo R, et al. Opioid therapy and immunosuppression: a review. American Journal of Therapeutics. 2004;11(5):354-365. Bayer B, et al. Morphine inhibition of lymphocyte activity is mediated by an opioid dependent mechanism. Neuropharmacology.1990;29(4):369-374. Frank C. Ligament structure, physiology and function. Journal of Musculoskeletal and Neuronal Interactions. 2004;4(2):199-201. Van Der Esch M, et al. Joint laxity and the relationship between muscle strength and functional ability in patients with knee osteoarthritis. Arthritis Care and Research. 2006;55(6):953-959. Woo S, et al. Injury and repair of ligaments and tendons. Annuals Reviews of Biomedical Engineering. 2000;2:83-118. Jung H, et al. Role of biomechanics in the understanding of normal, injured and healing ligaments and tendons. Sports Medicine, Arthroscopy, Rehabilitation, Therapy & Technology. 2009;1(1):9. Hollister S. Structure and function of ligaments and tendons [Online Lecture Notes]. Retrieved from: http://www.engin.umich.edu/class/bme456/ligten/ligten.htm. Provenzano P, et al. Subfailure damage in ligament: a structural and cellular evaluation. Journal of Applied Physiology.2002;92(1):362-371. Frank C, et al. Ligament healing: a review of some current clinical and experimental concepts. The Iowa Orthopaedic Journal.1992;12:21-28. Vereeke West R, et al. Soft-tissue physiology and repair. In A. Vaccaro (8). Orthopaedic Knowledge Update 8. 2005; (15-27). American Academy of Orthopaedic Surgeons: Rosemount, IL. Frank C, et al. Optimisation of the biology of soft tissue repair. Journal of Science and Medicine in Sport. 1999;2(3):190-210. Schwartz R. Prolotherapy: a literature review and retrospective study. Journal of Neurology, Orthopaedic Medicine, and Surgery.1991;12(3):220-223. Lewek M, et al. Knee stabilization in patients with medial compartment knee osteoarthritis. Arthritis and Rheumatism. 2005;52(9):2845-2853. Heldin C. Structural and functional studies on platelet-derived growth factor. EMBO Journal. 1992;11(12):4251-4259. Massagué J. TGF-beta signal transduction. Annual Review of Biochemistry. 1998;67:753–91. Green P, et al. Promiscuity of fibroblast growth factor receptors. Bioessays. 1996;18(8):639-46. Ornitz D, et al. Fibroblast growth factors. Genome Biology. 2001;2(3). Available at: http://www.biomedcentral.com/content/pdf/gb-2001-2-3-reviews3005.pdf. Accessed on October 12, 2011. Carpenter G, et al. Epidermal growth factor. The Journal of Biological Chemistry. May 1990;265(14):7709-12. Felson D, et al. Osteoarthritis: new insights part 1: the disease and its risk factors. Annals of Internal Medicine. 2000;133(8):635-46. Brody J. Personal health; a new set of knees comes at a price: a whole lot of pain. New York Times, published February 8, 2005. Buckwalter J, et al. Athletics and Osteoarthritis. The American Journal of Sports Medicine. 1997;25(6):873-881. Buckwalter J, et al. Joint injury, repair, and remodeling: roles in post-traumatic osteoarthritis. Clinical Orthopaedics and Related Research. 2004;(423):7-16. Andriacchi T, et al. A framework for the in vivo pathomechanics of osteoarthritis at the knee. Annals of Biomedical Engineering.2004;32(3):447-457. Buckwalter J. Sports, joint injury, and posttraumatic osteoarthritis. The Journal of Orthopaedic and Sports Physical Therapy.2003;33(10):578-588. Gelber A, et al. Joint injury in young adults and risk for subsequent knee and hip osteoarthritis. Annals of Internal Medicine.2000;133(5):321-328. Rall K, et al. A study of long term effects of football injury to the knee. Missouri Medicine. Jun 1984;61:435-438. Kujala U, et al. Osteoarthritis of weight bearing joints of lower limbs in former elite male athletes. BMJ (Clinical Research Ed.). 1994;308(6923):231-234. Kujala U, et al. Knee osteoarthritis in former runners, soccer players, weight lifters, and shooters. Arthritis and Rheumatism.1995;38(4):539-546. Juhakoski R, et al. Risk factors for the development of hip osteoarthritis: a population-based prospective study. Rheumatology (Oxford, England). 2009;48(1):83-87. Adams J. Injury to the throwing arm. A study of traumatic changes in the elbow joints of boy baseball players. California Medicine.1965;102:127-132. Bennett G. Shoulder and elbow lesions of professional baseball pitcher. JAMA. 1941;117:510-514. Forward D, et al. Do young patients with malunited fractures of the distal radius inevitable develop symptomatic post-traumatic osteoarthritis? The Journal of Bone and Joint Surgery, British Volume. 2008;90(5):629-637. Lawrence R, et al. Estimates of the prevalence of arthritis and other rheumatic conditions in the United States, part II. Arthritis and Rheumatism. 2008;58(1):26-35. Lawrence R, et al. Estimates of the prevalence of selected arthritis and musculoskeletal diseases in the United States. Arthritis and Rheumatism. 1998;41(5):778-799. Lawrence R, et al Estimates of the prevalence of selected arthritis and musculoskeletal diseases in the United States. Journal of Rheumatology. 1989;16(4):427-441. Felson D, et al. Osteoarthritis: new insights. Part 1: the disease and its risk factors. Annals of Internal Medicine. 2000;133(8):635-646. Petersson I, et al. Radiographic osteoarthritis of the knee classified by the Ahlback and Kellgren & Lawrence systems for the tibiofemoral joint in people aged 35-54 years with chronic knee pain. Annals of the Rheumatic Diseases. 1997;56(8):493-496. Felson D, et al. The incidence and natural history of knee osteoarthritis in the elderly. The Framingham Osteoarthritis Study. Arthritis and Rheumatism. 1995;38(10):1500-1505. HCUP Facts and Figures, 2006: AHRQ analysis of arthritis hospitalizations, retrieved from Hospitalizations for Osteoarthritis Rising Sharply. Available at: http://www.ahrq.gov/news/nn/nn090308.htm. Accessed on: October 12, 2011. Fleming B, et al. Ligament injury, reconstruction, and osteoarthritis. Current Opinion in Orthopaedics. 2005;16(5):354-362. Hart A, et al. Assessment of osteoarthritis after reconstruction of the anterior cruciate ligament: a study using single-photon emission computed tomography at ten years. The Journal of Bone and Joint Surgery, British Volume. 2005;87(11):1483-1487. Liden M, et al. Osteoarthritic changes after anterior cruciate ligament reconstruction using bone-patellar tendon-bone or hamstring tendon autografts: a retrospective, 7 year radiographic and clinical follow-up study. Arthroscopy. 2008;24(8):899-908. Neuman P, et al. Prevalence of tibiofemoral osteoarthritis 15 years after non-operative treatment of anterior cruciate ligament injury: a prospective cohort study. The American Journal of Sports Medicine. 2008;36(9):1717-1725. Rudolph K, et al. Age-related changes in strength, joint laxity, and walking patterns: are they related to knee osteoarthritis? Physical Therapy. 2007;87(11):1422-1432. Schmitt L, et al. Instability, Laxity, and physical Function in patients with medial knee osteoarthritis. Physical Therapy.2008:88(12):1506-1516. Bierma-Zeinstra S, et al. Risk factors and prognostic factors of hip and knee osteoarthritis. 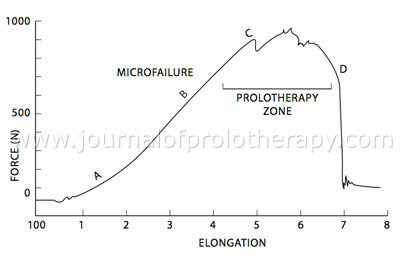 Nature Clinical Practice, Rheumatology.2007;3(2):78-85. Hoaglund F, et al. Primary osteoarthritis of the hip: etiology and epidemiology. The Journal of the American Academy of Orthopaedic Surgeons. 2001;(5):320-327. Jensen L, et al. Hip osteoarthritis: influence of work with heavy lifting, climbing stairs or ladders, or combining kneeling/squatting with heavy lifting. Occupational and Environmental Medicine. 2008;61(1):6-19. Vingard E, et al. Osteoarthritis of the hip in women and its relation to physical load at work and in the home. Annals of the Rheumatic Diseases. 1997;56(5):293-298. Shepard G, et al. Ex-professional association footballers have an increased prevalence of osteoarthritis of the hip compared with age matched controls despite not having sustained notable hip injuries. British Journal of Sports Medicine. 2003;37(1):80-81. Koh J, et al. Osteoarthritis in other joints (hip, elbow, foot, ankle, toes, wrist) after sports injuries. Clinics in Sports Medicine.2005;24(1):57-70. Callahan L, et al. Osteoarthritis in retired National Football League players: The role of injuries and playing position. Arthritis and Rheumatism. 2002;(46):S415. Neer C, et al. Recent experience in total shoulder replacement. Journal of Bone and Joint Surgery. 1982;64(3):319-337. Ogawa K, et al. Osteoarthritis in shoulders with traumatic anterior instability: preoperative survey using radiography and computed tomography. Journal of Shoulder and Elbow Surgery. 2006;15(1):23-29. Woodward T, et al. The painful shoulder: part II. Acute and chronic disorders. American Family Physician. 2000;1(11):3291-3300. Dvorak J, et al. Football injuries and physical symptoms. The American Journal of Sports Medicine. 2000;28:S-3-S-9. Hintermann B, et al. Medial ankle instability: an exploratory, prospective study of fifty-two cases. American Journal of Sports Medicine.2004;32(1):183-190. Karlsson J, et al. Chronic lateral instability of the ankle in athletes. Sports Medicine (Aukland, N.Z.). 1993;16(5):355-365. Valderrabano V, et al. Ligamentous posttraumatic ankle osteoarthritis. The American Journal of Sports Medicine. 2006;34(4):612-620. Hashimoto T, et al. A kinematic study of ankle joint instability due to rupture of the lateral ligaments. Foot and Ankle International.1997;18(11):729-734. Jones W, et al. Beware the sprained wrist. The incidence and diagnosis of scapholunate instability. The Journal of Bone and Joint Surgery, British Volume. 1988;70(2):293-297. Rettig A, et al. Epidemiology of hand and wrist injuries in sports. Clinics in Sports Medicine. 1998;17(3):401-406. Knirk J, et al. Intraarticular fractures of the distal end of the radius in young adults. The Journal of Bone and Joint Surgery, American Volume. 1986;68(5):647-59. Ray C, et al. Understanding Osteoarthritis of the Spine. Spine Health: Trusted Information for Pain Relief. Available at: http://www.spine-health.com/conditions/arthritis/understanding-osteoarthritis-spine. Accessed on October 12, 2011. Vogt M, et al. Lumbar olisthesis and lower back symptoms in elderly white women. The study of osteoporotic fractures. Spine.1998;23(23):2640-2647. Revolution Health Group: How to cover – and cut – the rising cost of osteoarthritis care. Available at: http://www.revolutionhealth.com/conditions/arthritis/osteoarthritis/what-you-can-do/arthritis-costs?id=article.2007-07-13.0406371040&section=section_02. Accessed on October 12, 2011. Gabriel S, et al. Direct medical costs unique to people with arthritis. Journal of Rheumatology. 1997;24(4):719-725. Maetzel A, et al. Community hypertension and arthritis project study team. The economic burden associated with osteoarthritis, rheumatoid arthritis, and hypertension: a comparative study. Annals of Rheumatic Diseases. 2004;63(4):395-401. White A, et al. Direct and indirect costs of pain therapy for osteoarthritis in an insured population in the United States, 2008. Hylek E, et al. Acetaminophen and other risk factors for excessive warfarin anticoagulation. JAMA. 1998;279(9):657-662. Camu F, et al. Pharmacology of systemic analgesics. Best Practice and Research Clinical Anesthesiology. 2002;12(4):475-488. Solomon G. The use of cox-2-specific inhibitors with specific attention to use in patients requiring orthopedic surgical interventions.Orthopedic Special Edition. 2002;8:11-13. Greene J. Cost-conscious prescribing of nonsteroidal anti-inflammatory drugs for adults with arthritis. Archives of Internal Medicine.1992;152:1995-2002. Almekinders L. An in vitro investigation into the effects of repetitive motion and nonsteroidal anti-inflammatory medication on human tendon fibroblasts. American Journal of Sports Medicine. 1995;23:119-123. Waknine Y. NSAIDs inhibit tendon-to-bone healing in rotator cuff repair. Presented at the American Orthopedic Society for Sports Medicine. June 28, 2004. Available at: http://www.medscape.com/viewarticle/481998. Accessed October 12, 2011. Kulick M. Oral ibuprofen: evaluation of its effect on peritendinous adhesions and the breaking strength of a tenorrhaphy. The Journal of Hand Surgery. 1986;11A:100-119. Hauser R. The acceleration of articular cartilage degeneration in osteoarthritis by nonsteroidal anti-inflammatory drugs. Journal of Prolotherapy. 2010;2(1):305-322. Wright J. The double-edges sword of COX-2 selective NSAIDs. Canadian Medical Association Journal. 2002;167(10):1131-1137. Newman N, et al. Acetabular bone destruction related to non-steroidal anti-inflammatory drugs. The Lancet. 1985;2(8445):11-13. Ronningen H, et al. Indomethacin treatment in osteoarthritis of the hip joint. Acta Orthopaedica Scandinavica. 1979;50(2):169-174. Huskisson E, et al. Effects of anti-inflammatory drugs on the progression of osteoarthritis of the knee. Journal of Rheumatology.1995;22(10):1941-1946. Reijman M, et al. Is there an association between the use of different types of nonsteroidal anti-inflammatory drugs and radiologic progression of osteoarthritis? The Rotterdam Study. Arthritis and Rheumatism. 2005;52(10):3137-3142. Buckland-Wright J, et al. Quantitative microfocal radiography detects changes in OA knee joint space width in patients in placebo-controlled trial of NSAID therapy. Journal of Rheumatology. 1995;22(5):937-943. Palmoski M, et al. Aspirin aggravates the degeneration of canine joint cartilage caused by immobilization. Arthritis and Rheumatism.1982;25(11):1333-1342. Palmoski M, et al. Effect of salicylate and indomethacin on glycosaminoglycan and prostaglandin E2 synthesis in intact canine cartilage ex vivo. Arthritis and Rheumatism. 1984;27(4):398-403. Palmoski M, et al. Marked suppression by salicylate of the augmented proteoglycan synthesis in osteoarthritis cartilage. Arthritis and Rheumatism. 1980;23(1):83-91. Palmoski M, et al. Effects of some nonsteroidal antiinflammatory drugs on proteoglycan metabolism and organization in canine articular cartilage. Arthritis and Rheumatism. 1980;23(9):1010-1020. Brandt K, et al. Nonsteroidal anti-inflammatory drugs in treatment of osteoarthritis. Clinical Orthopedics and Related Research. 1986;(213):84-91. Palmoski M, et al. Relationship between matrix proteoglycan content and the effects of salicylate and indomethacin on articular cartilage. Arthritis and Rheumatism. 1983;26(4):528-531. Serni U, et al. Is there preliminary in-vivo evidence for an influence of nonsteroidal anti-inflammatory drugs on progression in osteoarthritis? Part II-evidence from animal models. Osteoarthritis and Cartilage. 1999;7(3):351-352. Chang J, et al. Effects of non-steroidal anti-inflammatory drugs on cell proliferation and death in cultured epiphysealarticular chondrocytes of fetal rats. Toxicology. 2006;228(2-3):111-123. Brochhausen C, et al. Cyclooxygenases and prostaglandin E2 in growth plate chondrocytes in vitro and in situ – Prostaglandin E2 dependent proliferation of growth plate chondrocytes. Arthritis Research and Therapy. 2006;8(3):R78. Gossec L, et al. Predictive factors of total hip replacement due to primary osteoarthritis: a prospective 2 year study of 505 patients.Annals of Rheumatic Diseases. 2005;64(7):1028-1032. Caldwell J, et al. Efficacy and safety of a once-daily morphine formulation in chronic, moderate-to-severe osteoarthritis pain: results from a randomized, placebo-controlled, double-blind trial and an open-label extension trial. The Journal of Pain and Symptom Management.2002;23(4):278-291. Woo S, et al. Injury and repair of musculoskeletal soft tissues. AJ Orth Res. 1988;6:907-931. Mankin H. Localization of tritiated thymidine in articular cartilage of rabbits inhibits growth in immature cartilage. Journal of Bone and Joint Surgery. 1962;44A:682. American Academy of Orthopaedic Surgeons (2008). Treatment of osteoarthritis of the knee (non-arthroplasty): Full Guideline. Adopted by the American Academy of Orthopaedic Surgeons Board of Directors, December 6, 2008. Deyle G, et al. Effectiveness of manual physical therapy and exercise in osteoarthritis of the knee. A randomized, controlled trial. Annals of Internal Medicine. 2000;132(3):173-181.
Cooper R, et al. A systematic review of the effect of propriocetive and balance exercises on people with an injured or reconstructed anterior cruciate ligament. Research in Sports Medicine. 2005;3(2):163-178. Jamtvedt G, et al. Physical therapy interventions for patients with osteoarthritis of the knee: an overview of systematic reviews. Physical Therapy. 2008;88(1):123-136. Messier S, et al. Exercise and dietary weight loss in overweight and obese older adults with knee osteoarthritis: the Arthritis, Diet, and Activity Promotion Trials. Arthritis and Rheumatism. 2004;50(5):1501-1510. Midwood K, et al. Tissue repair and the dynamics of the extracellular matrix. The International Journal of Biochemistry & Cell Biology.2004;36(6):1031–1037. Tidball J, et al. Macrophage invasion does not contribute to muscle membrane injury during inflammation. Journal of Leukocyte Biology. 1999;65(4):492–498. Schiaffino S, et al. Skeletal muscle repair and regeneration. Advances in muscle research (3rd ed.). Dordrecht, The Netherlands: Springer; 2008. Foster T, et al. Platelet-rich plasma: from basic science to clinical applications. The American Journal of Sports Medicine.2009;37(11):2259-2272. Sampson S, et al. Platelet rich plasma injection grafts for musculoskeltal injuries: a review. Current Reviews in Musculoskeletal Medicine. 2008;1(1):165-174. Hauser R, et al. Prolo Your Sports Injuries Away. Oak Park, IL: Beulah Land Press; 2001. Chevron V, et al. Respiratory impact of new anesthetic agents. Revue des Maladies Respiratoires. 1998;15(2):123-128. Snoeck M, et al. Malignant hyperthermia as a complication of anesthesia: predisposition is hereditary. Nederlands Tijdschrift Voor Geneeskunde. 1997;141(13):616-619. American Academy of Orthopaedic Surgeons (2007). Joint Replacement. Retrieved from: http://orthoinfo.aaos.org/topic.cfm?topic=A00233. Hackett G. Ligament and Tendon Relaxation Treated by Prolotherapy. 3rd ed. Springfield, IL: Charles S. Thomas; 1958. Klein R, et al. Proliferant injections for low back pain: histologic changes of injected ligaments and objective measurements of lumbar spinal mobility before and after treatment. Journal of Neurologic and Orthopedic Medicine and Surgery. 1989;10:123-126. Liu Y, et al. An in situ study of the influence of a sclerosing solution in rabbit medial collateral ligaments and its junction strength.Connective Tissue Research. 1983;11:95-102. Klein R, et al. Prolotherapy: an alternative way of managing low back pain. Journal of Musculoskeletal Medicine. 1997;45-49. Ongly M, et al. Ligament instability of knees: a new approach to treatment. Manual medicine. 1988;3:152-154. Auburn A, et al. Increase in cross sectional area of the iliolumbar ligament using Prolotherapy agents: an ultrasonic case study. Journal of Prolotherapy. 1999;1(3):156-162. LaCourse M, et al. A report on the asymmetry of iliac inclination. Journal of Orthopaedic Medicine. 1990;12. Hauser R, et al. Prolotherapy as an alternative to surgery. A prospective pilot study of 34 patients from a private medical practice.Journal of Prolotherapy. 2010;2(1):272-281. Reeves K, et al. Long-term effects of dextrose Prolotherapy for anterior cruciate ligament laxity. Alternative Therapies in Healthy and Medicine. 2003;9(3):58-62. Barré J. Sur un syndrome sympathique cervical posterieur et sa cause frequente l’arthrite cervical. Revue Neurologique, Paris.1926;1246-1254. Dorman T. Prolotherapy, a Survey. Journal of Orthopaedic Medicine. 1993;15(2);49-50. Linetsky F, et al. Regenerative injection therapy (RIT): effectiveness and appropriate usage. Position paper by The Florida Academy of Pain Medicine (FAPM). 2001;1-12. Klein R, et al. Prolotherapy for the treatment of back pain. American Association of Orthpaedic Medicine Position Statement. 2006;1-5. Yelland M, et al. Prolotherapy injections saline injections and exercises for chronic low back pain: a randomized trial. Spine.2004;29(1):9-16. Mooney V. Prolotherapy at the fringe of medical care, or is it at the frontier? Spine. 2003;3(4):253-4. Reeves K, et al. Randomized, prospective placebo-controlled double-blind study of dextrose Prolotherapy for osteoarthritic thumb and finger joints: evidence of clinical efficacy. Journal of Alternative and Complementary Medicine. 2000;6(4):311–320. Reeves K, et al. Randomized, prospective placebo-controlled double-blind study of dextrose Prolotherapy for osteoarthritic thumb and finger joints: evidence of clinical efficacy. Journal of Alternative and Complementary Medicine. 2000;6(4):77-80. Hauser R, et al. Standard clinical x-ray studies document cartilage regeneration in five degenerated knees after Prolotherapy. Journal of Prolotherapy. 2009;1(1):22-28. Hauser R, et al. A retrospective study on Hackett-Hemwall dextrose Prolotherapy for chronic hip pain at an outpatient charity clinic in rural Illinois. Journal of Prolotherapy. 2009;1(2):76-88.